This Savsé Protein Smash is sported as a strawberry milkshake with a twist of coconut and apple. Often smoothies have a secret banana ingredient that makes the smoothie just taste of banana. 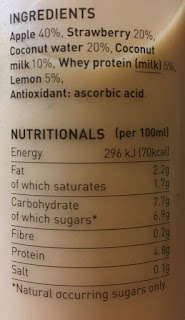 There didn't seem to be any banana in this drink's ingredients, although it was a yellowish milky colour after a good shake straight from the fridge. I do hate sneaky banana in smoothies and milkshakes as to me it spoils the taste of the other ingredients. On opening the bottle there was a luscious strawberry smell with a good hit of apple and a hint of coconut milk. Okay good no banana in the ingredients… check! No banana in the smell… check! Once I began drinking I realised the 100ml serving suggestion would go straight out of the window. This Strawberry Protein Smash, which is what it should be called, has strawberry as a dominate flavour mixed well with the creamy coconut milk throughout, whilst my tastebuds were tickled by the apple that lends an extra tang. This was a simply delicious pudding drink that felt healthy as well as wholesome. I'd certainly have it again, and not one banana in sight! 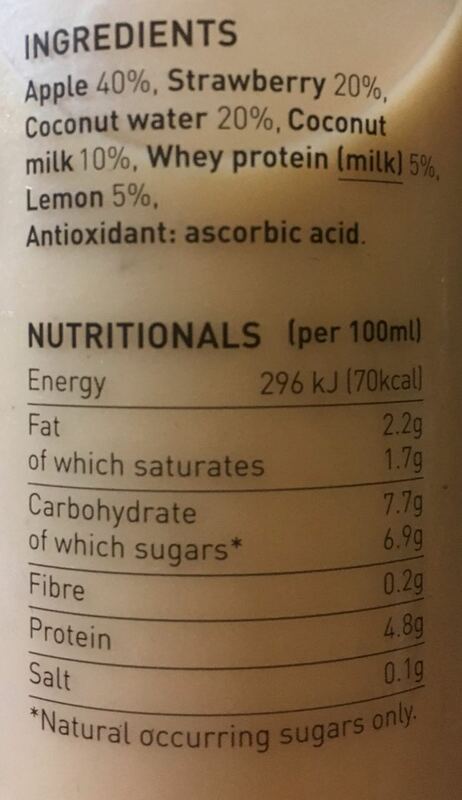 The 250ml bottle contains per 100ml serving 2.2g of fat, 6.9g of sugar, and 0.1g of salt. Ingredients included; apple (40%), strawberry (20%), coconut water (20%), coconut milk (10%), whey protein milk (5%), and lemon (5%).